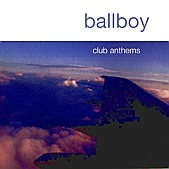 Ballboy's Club Anthems is a European indie-pop treat, at times sounding like the indie version of the Moody Blues, while at other times blending the beauty of Belle & Sebastian with their own spin. From the bouncy, lush "Donald in the Bushes with a Bag of Glue". The layered rock of "One Sailor Was Waving". To the indie Moody Blues with a pop twist sounds of "They'll Hang Flags From Cranes Upon My Wedding Day". Ballboy balances their influences well, creating unique, crafty pop songs that stretch the boundaries and re-create the genre, while doing stuff others have already done - just putting a new spin on it. I'll give it an A-.